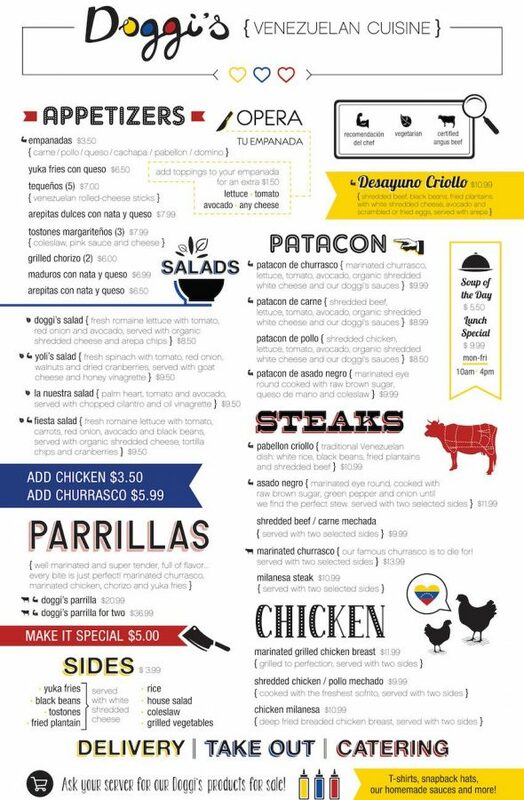 I’m not sure how long I’ve been telling myself that I’m gonna hit up Doggi’s Arepa Bar but I finally dropped in to their location on Biscayne Blvd. I made sure to seat myself by the window to get some natural light action aka how to have the best looking photos. 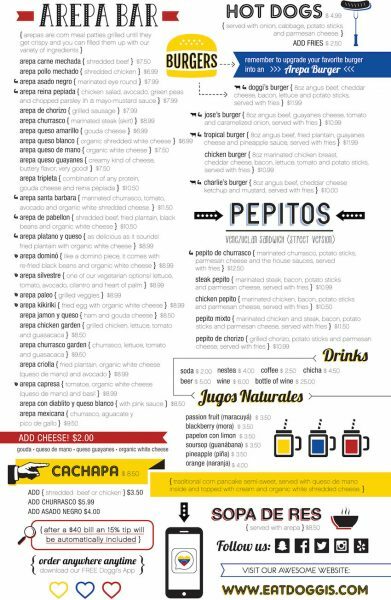 I was familiar with the menu from checking it out online but felt overwhelmed trying to just pick out a few items to try. *At that exact moment, the owner Giovanni comes over to my table and introduces himself. We talk briefly about the menu and I order. Every place in Miami has some variation of Coffee but it’s not often that I order one and enjoy it black. It really wasn’t intentional as I dropped a packet of sugar into it and started sipping away. Who needs half & half anyway I thought? This guy…BUT..it was very good. I order the Pabellon Empanada (shredded beef, black beans, plantains & house white cheese) which is served up “Operada” or open face. Besides being awesome this empanada is a meal in itself. I have to stop myself from eating the entire thing or there’s no way I’ll be able to even try everything else I ordered. I went a little lighter with my Arepa option (they’ve got over 20 to choose from) and chose the Kikiriki (fried egg with shredded cheese). The egg was cooked beautifully and that salty shredded cheese was so good. I was trying to figure out how much of it to eat when one of the loves of my life arrives. Oh cachapa, how I love thee! If you’ve never eaten a cachapa then you’re missing out on one of life’s greatest treasures. I know, I’m over selling this a bit but I’m a big fan of this dish. A cachapa is essentially a corn pancake folded over a slab of house-made cheese. Believe it or not, I only ate one bite but only because I knew I would eat it later (and did). I’ve got a big aversion to anything green on my Burgers. It’s a common misconception that I won’t have a tomato on a Burger. 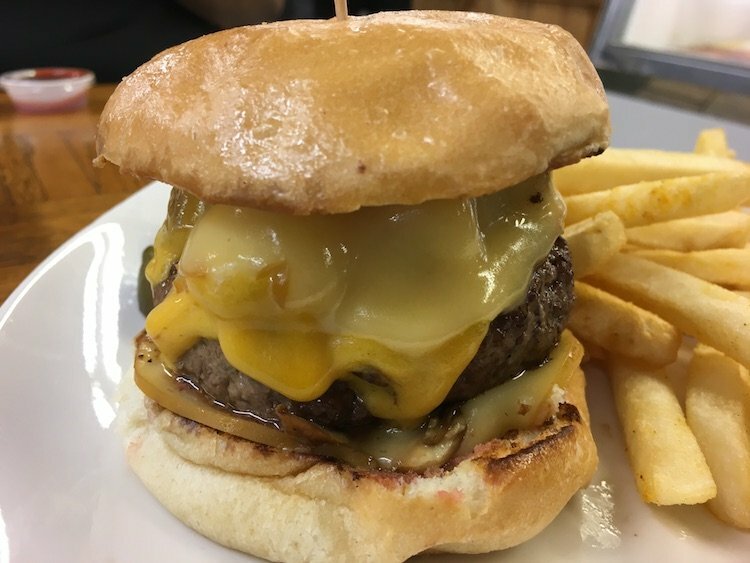 It’s not really my preference but after checking out Jose’s Burger (house-made white cheese, caramelized onions & tomato) it seemed like the fella to get. It’s an 8 oz patty cooked properly to my preferred temp, Medium. I loved it but I can’t help but think that two 4 oz. burger patties would work better. Just throwing that out there…. As I walked out of Doggi’s Arepa Bar I couldn’t help but think of all the work I have ahead of me. I haven’t even made a dent in trying everything on the menu but I’ll get there. *The owner spotted me when I walked into Doggi’s Arepa Bar and covered my meal. It was very nice of him and even though I insisted I would pay for it there was no changing his mind. I’m just glad I loved the food and had every reason in the world to write about it.